A little bit of news for you, especially if you’re interested in a bit of old school DJ action. 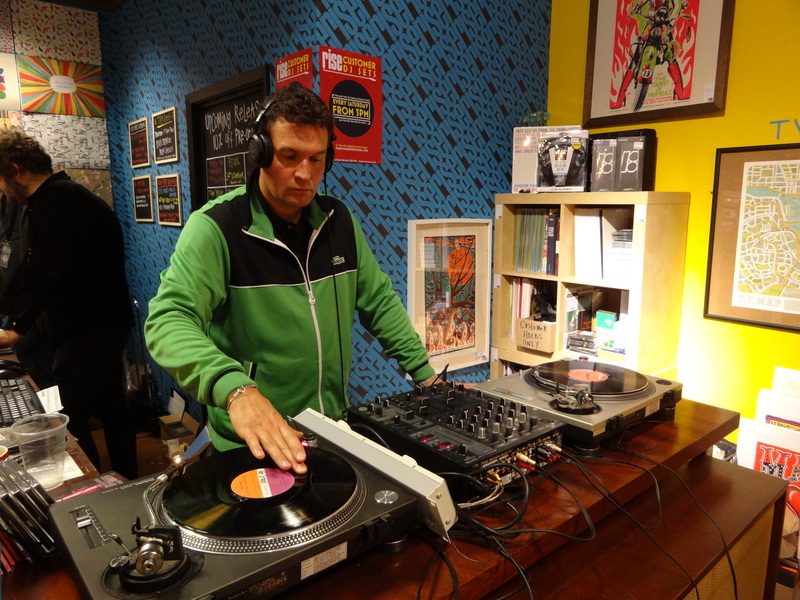 I’ll be hitting the decks at Rise, the best record shop in Bristol, tomorrow afternoon. Here’s a short interview I did to promote the gig, conducted with Rob from Excuses And Half Truths. 1. How long have you been DJing for? My first out-of-bedroom performance was at college. Sometime between ’93-’95. I must have put together my first mix tape in the mid to late 80’s. 2.What do you enjoy most about it? One of the main things has to be connecting with people. I see the aim of the DJ as being to entertain people. If you sense playing a tune has helped to put a smile on someone’s face that has got to be a good thing. Obviously the people who made the music have a large part to play in this. DJs have been described as filters — you could also call them music messengers. I wouldn’t say I have reached any dizzying heights with my DJ’ing. I played in a kitchen at a friend’s party in London. I liked that because there is a scene in the film Wild Style where Grandmaster Flash is seen spinning in a kitchen! I enjoyed my turns at 6 Foot Stereo in London in various bars. More recently I have just got on the decks at The Cube in Bristol and spun a few tunes. The Cube is a volunteer-run cinema and artists’ space near Stoke’s Croft. 4. What’s going on at Rise on Saturday? Apart from them aiming to sell as many pieces of stock as possible? DJs have been playing every Saturday afternoon since Record Store Day this year. Rise is an independent record shop. They no doubt have one of the best selections of music in Bristol, Cheltenham and Worcester. I have been spending too long in record shops from an early age! 5. What sort of set-up will you be using? They have two Technics SL1210s and a fairly standard mixer. I will take along my own Sony MDR-V500 headphones. I like to take a record cleaner with me. 6. Are you going old-school vinyl only? I will be playing the vast majority of the sounds from vinyl. I may put a few cds in my bag if there is something on CD that I do not have on vinyl. 7. Any clues as to the sort of music we can expect from you? My music collection covers many styles. Everything from John Coltrane to the current Aphex Twin album. I will take a selection of soundtracks along. I like dropping things like Executive Party from the 1970’s film Rollerball. I have around 900 pieces of vinyl to choose from. The first track I play might be the Muppet Show theme! Sounds like a blast, eh? If you’re in Bristol on Saturday, do feel free to drop in and say hello.